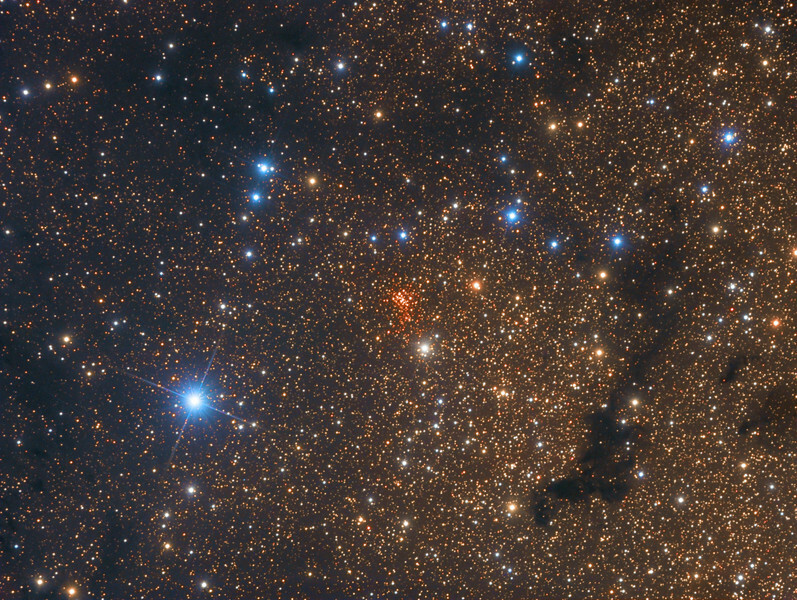 This image shows the compact young star cluster Westerlund 1 which is located some 15,000 light years away in the central galactic bar of our Milky Way galaxy. The cluster is heavily obscured by interstellar dust and therefore appears only as a faint group of deeply reddened stars in optical images. However, in the infrared part of the spectrum the cluster shines brightly and reveals its true nature as a rare super star cluster; a very massive and luminous star cluster thought to be the precursor of a future globular cluster. Westerlund 1 contains one of the largest known stars, Westerlund 1-26, a red hypergiant with a diameter 1500 times larger than that of the Sun. Based on stellar evolution models, the cluster is estimated to be very young in astronomical terms - only 4-5 million years old. This image shows the cluster as it appears in the optical spectrum, without any contribution from infrared light. In comparison, click here to see the same field in Near infrared (NIR).